Posted on February 23, 2015 by Sumit Gilhotra. Updates: GSEB 10th class Exams Commencing from 12th march 2015. The Gujarat Secondary & Higher Secondary Education Board (GSHSEB) was constituted in the year 1972, following the enactment of Gujarat Secondary Education Act 1972. Gujarat State Government appoints GSEB’s Chairman and Deputy Chairman. As per the official updates, GSEB 10th time table 2015 is announced and exam papers are Commencing from 12th march 2015. The Gujarat board is providing Best education to all the students of Gujarat. 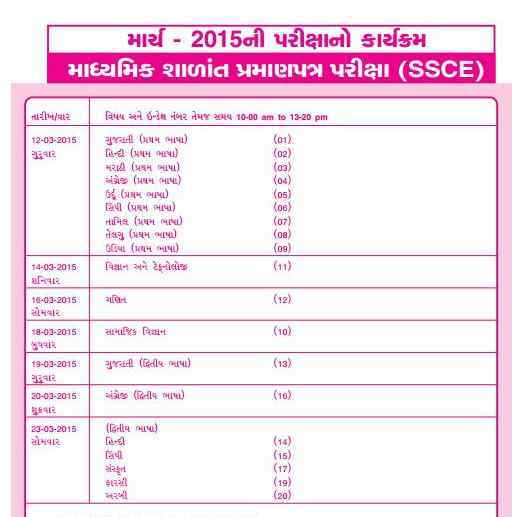 According to the Gujarat Board SSC Time table 2015, the main Annual exam are starting from Thursday, 12th March 2015 till Monday, 23rd March 2015. GSEB is a government body responsible for regulating and maintaining the functions of state’s higher educational system. GSEB is known for their quality education system. Gujarat Board have their headquarters in the Gandhinagar. Gujarat Board provides textbooks to the students for all standards. Gujarat State Education Board or GSEB is responsible for conducting the GSEB SSC 10th exam 2015. More than 7 lacs of students are going to appear in these Guj. Board SSC exam. State Government guidance and policies are implemented for the development of qualitative enhancement in Secondary and higher secondary Education. Students who are willing to know their 10th matric Gujarat date sheet, they just have to go to IndiaResults.com. IndiaResults is no.1 exam results website in India and publishes all the details and results at Official GSEB page. Indiaresults.com is the top result publishing portal in India. All the details for board exams are available to check or to download from the www.indiaresults.com. Stay tuned for more Updates and Result notifications from GSEB higher secondary exam.